EATON — Jake Tinsley does not just hit a golf ball — he launches it. In his first Eaton Country Club Championship finals, Tinsley took advantage of this by defeating defending Club Champion Tim Garber on Sunday, Sept. 2. 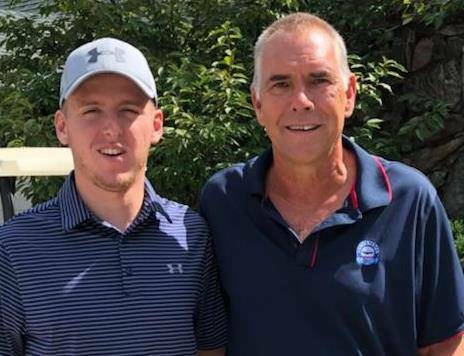 Tinsley started playing golf when he was around 6 years old, at ECC, by joining his great-grandparents, Jerry and Hilda Curtis when they played. Tinsley later continued with golf by playing on the Defiance College golf team, and was a two-time all-conference player his junior and senior years. Garber has now made the finals two years in a row, something not done very often. He is in charge of the ECC pro shop and oversees course maintenance. Eaton Country Club’s Men’s Championship has a long-standing tradition of club and family members following the match, and this year’s match was no exception with a large group following the players during their match. Eaton Country Club welcomes the public to the restaurant, driving range and has open golf several times through the week. Call 937-456-6922 for more information.